Yesterday, I wrote about how taking public transportation can save you money even if you just let a car sit in the driveway while taking the bus. For quite a lot of us, though, public transportation isn’t an option. Even those who have a public transportation line near their home often find themselves without a place to depart that’s anywhere close to their place of work. That leaves the door wide open to another option: carpooling. It’s one Sarah used for several years with great success. When we moved to our current home, both Sarah and I had about a thirty minute commute to our respective jobs. The house we selected was pretty close to a midway point between our places of employment. Both of us looked for coworkers who lived near us that we could carpool with to save money. I didn’t find one. Sarah did. Sarah started carpooling with a much older fellow who was very close to retirement, and they carpooled together almost every day for the last two years of his working career. After the first year, Sarah sat down and calculated how much money she saved due to carpooling. According to her best estimates, she saved about $1,200 a year. Not only that, carpooling saved her time, too. She would spend a significant portion of most of the rides doing additional work, which would free her to spend more time with the family at home. Every other day, she could get an hour of work done that she would otherwise be doing at home. That time would often result in better meals prepared at home, preparation of leftovers for lunch the following day, more effective creation of grocery lists, and other such little things that would save us additional money beyond mere carpooling. If you can find three or four people to carpool with, even better. That reduces your driving time (and wear on your vehicle) even more and adds more “backup driver” redundancy to your carpool. How much can this save you? It depends on how you calcuate this, but when you add up all of the little costs, every mile you drive costs you at least $0.50 in fuel, maintenance, wear and tear, depreciation, tolls, and other such factors. If you’re commuting 10 miles each way every day, for example, that’s $10 a day, whether you directly see it or not. 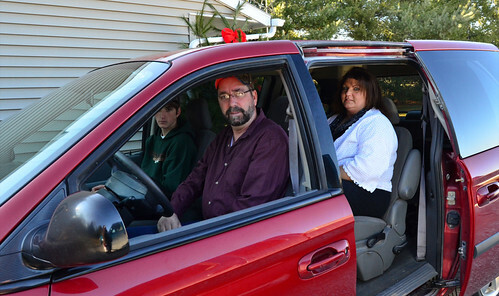 Carpooling spreads out that cost. If you’re carpooling with two other people, that cuts your annual commuting days down from 240 to 80 (approximately). If you’re commuting that ten mile stretch mentioned above, you’re saving $1,600 a year just by carpooling. That can be an enormous savings. That’s half a year’s worth of car payments on a reliable used car.